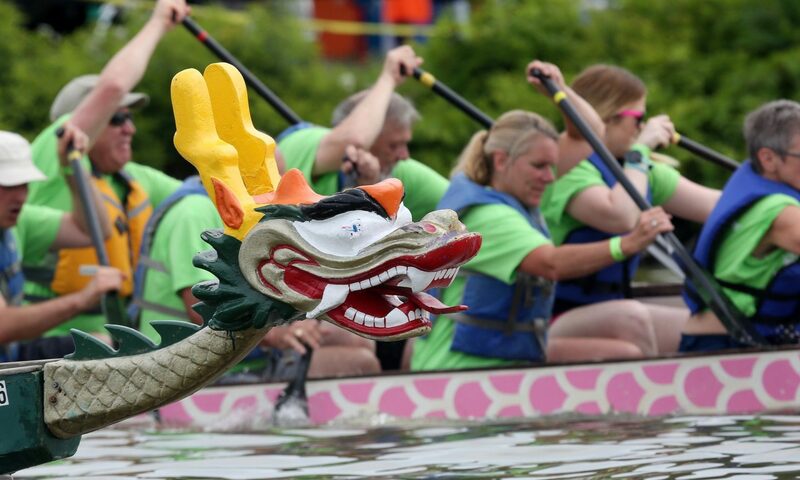 What is a Dragon Boat Race? PFDs/Life Jackets: Everyone must wear an approved Personal Flotation Device or life jacket during Practice Week and on Race Day, whenever sitting in the boat or walking from the marshaling area to the dock. Never stand up in the boat. Buddy System: Make certain you that each of your team members knows who is sitting beside them in case the boat swamps/capsizes (highly unlikely, but if prepared, you won’t have any worries). Teammates will be responsible for each other’s safety until rescue arrives. STAY WITH THE BOAT! No consumption of alcoholic beverages before/during a session on the water. Conduct in the Boat: There is to be no unnecessary rocking, tipping, splashing or other unsafe or otherwise annoying behavior. Paddlers will be disqualified from the team, and/or teams may face disqualification. Do not excessively lean over the side or bounce around on your seat. There should be minimal talking once your team is in the boat. The drummer and steerer must be able to communicate with the team and each other at all times, and all team members need to be able to hear the commands. Put your paddle straight up in the air if you need to draw attention to yourself in case of emergency. Steerer: Stands in the back of the boat with a long wooden rudder over one side. Frequently gives commands and instructions and coaches the paddlers, since this person can see down the course and is responsible for the safe travel of the boat during practice or a race. This person is a professional supplied by the race company. Paddles Up: Sit ready to paddle, turning your chest to your buddy and back to the water. Extend your arms and hold your paddle above the water 3-6 inches, pointing down. Take it Away: Begin paddling. Let it Run: Stop paddling and let the boat glide. Hold the Boat or Stop the Boat: Place paddles in the water, with paddle pointed straight down, blade submerged. It will bring the boat to a stop. If you hear the command, “Hold hard,” quickly put your paddle straight down and then push the paddle forward, away from you, one stroke. Back it Down: Paddle backwards pushing the paddle away from you. Used mostly to move away from a dock. Draw (left or right side): Initiates a turn using draw strokes. With your paddle, pull the water towards you, like having lost something and trying to scoop it back. Can also be used to get the boat closer to something, a dock, for example. Brace the Boat or Stabilize the Boat: Place your paddle blade on top of the water and spread the water surface like icing on a cake. Rest the shaft of the paddle against the gunnel. This stabilizes the boat. It is needed when there is a wake from a large vessel passing by or in the extremely rare situation if anyone stands up in the boat to change position. one person at a time, starting first with “waterside” person in Row 5, then his or her partner, who is the “dockside” person in Row 5. Continue this way with Rows 6 and 7. Then continue the same way with Rows 4, 3, 2, and 1. Then rows 8, 9, and 10. The drummer is next, who has probably been holding the bowline. Wait for assistance from the dock volunteers before exiting the boat one person at a time. Exit the boat by starting at the front, each paddler helping the next, drummer first, and he or she can hold the bowline. Port stroke then gets out and helps his or her partner. Then 7, 4, 8, 3, 9, 2, 10, 1. The purpose of all of this is to keep the boat balanced at all times. Rotate: While seated in the boat, before placing paddle in the water, twist torso at waist, align your shoulder blades towards the water, chest to your partner sitting alongside you. Press your hip firmly against the side of the boat, with this leg stretched out forward in front of you. Your other leg (closest to the inside of the boat) can be either bent at the knee and tucked beneath the sitting bench or also stretched forward like the outside leg. Reach Extension: Top hand next to your ear, slightly bent, and reaching up and forward. Bottom hand forward and straight, over the gunwale. Should make the sign of an “A” with your two arms and the paddle. Arm Drive: After getting into position, fully rotated and extended, bend slightly forward from the waist and thrust the paddle down into the water with the arms. Most of your effort will come from the bottom hand, using the top for guidance and secondary thrusting power. Catch: Blade is square and completely buried. Ideally, your blade is in the water across from the hip/thigh of the paddler in front of you in the boat. Some paddlers get the bottom hand slightly wet in the water with each stroke. Pull: Continue forcing paddle backward in the water with upper hand, keep lower arm straight and strong while using back muscles and abs (stomach) to unwind to a position facing straight ahead. Sit up, bringing the outside shoulder back, pulling the blade right beside the boat. Exit: Blade is just past your knee to mid-thigh. Pull blade up and out of the water. Everyone’s paddle should be in the water at the start of the race. This helps to stop the boat from moving forward on the start line, and also means that the first action taken on the starting line will be to push the boat forward, because the paddles will be in contact with the water. If the paddles are out of the water at the start, especially in beginner crews, your timing could soon get out of sync. The most important part of successful team paddling is being in sync (and not to “sink.” The winning teams keep their paddling strokes together. A “caterpillar motion” or “domino effect” occurs when each paddler goes just one nanosecond slower than the paddler in front. When paddlers are out of sync, the boat slows down. Strength and athletic ability are not as important as being in harmony and keeping a precise rhythm. But ultimately, it will be a fun time out on the water with your friends. Breathe…relax… smile…and enjoy the journey!